Angiogenesis is a multi-stage process that drives the generation of new blood and lymphatic vessels from pre-existing ones. It is highly active during embryogenesis, largely inactive during adulthood but reactivated during wound healing and under a number of pathological conditions including cancer and ocular diseases. In addition to endothelial cells, which line the walls of the vessels, several other cell types (pericytes, macrophages, progenitor cells…) also contribute to angiogenesis. A number of signaling pathways are activated and very finely tune the delicate morphogenetic events that ultimately lead to the formation of stable blood proof neovessels. 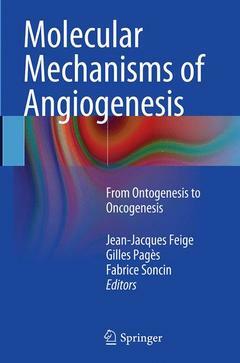 This book reviews recent advances in our understanding of the molecular and cellular mechanisms of angiogenesis, with a focus on how to integrate these observations into the context of developmental, post-natal and pathological neovascularization. Angiogenesis and Invasion in Malignant Glioma: Friends or Foes? VEGF-A Splice Variants: Do They Play a Role in Tumor Responses to Anti-angiogenic Therapies? • Dr Jean-Jacques Feige, PhD, is President of the French Society of Angiogenesis, research director at INSERM (National Institute for Health and Medical Research) and runs an academic research laboratory (Biology of Cancer and Infection) in Grenoble, France. • Dr Gilles Pagès, PhD, is deputy President of the French Society of Angiogenesis, research director at INSERM and runs an academic research group at the Institute for Research on Cancer and Aging of Nice (IRCAN) in the Centre Antoine Lacassagne of Nice. • Dr Fabrice Soncin, PhD, is the former President of the French Society of Angiogenesis, research director at INSERM and runs an academic research team at the CNRS Institute of Biology of Lille, France.